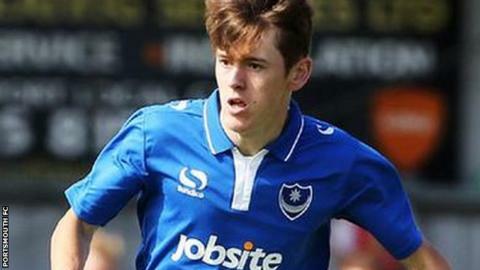 Portsmouth have agreed a deal to bring winger Ben Tollitt to the club from non-league Skelmersdale United. Tollitt, 20, has been on trial with the League Two side and featured in a pre-season friendly against Havant & Waterlooville on Saturday. He moves to Fratton Park on a one-year deal with the option of an extension. "I'm made up. It's my first professional contract and I can't wait to get started," Tollitt told the club's official website. Tollitt had only been with Northern Premier League Skelmersdale since November after impressing against them in a Liverpool Senior Cup tie for Widnes. "We'd seen something in the lad we felt we could work with and progress," Skelmersdale manager Tommy Lawson told BBC Radio Solent. "That was the beginning really and, in that time, he progressed really quickly despite stepping up three divisions. "He's two-footed and an exciting player with that tremendous ability to get a cross away. "I think supporters down at Portsmouth are going to be watching a very exciting youngster."